Monday, January 8–Friday, March 2, 2018: I Am Trying To Be Marvelous: The Poetics of Body Positivity, a generative online poetry workshop through 24PearlStreet from the Fine Arts Works Center of Provincetown. Thursday, February 1, 2018: Alumni Spotlight Reading feat. Roselyn Elliot, Nathan Long, Emilia Phillips, and Michelle Young-Stone, MFA in Creative Writing, Virginia Commonwealth University, Richmond, VA.
Saturday, February 9, 2018: “I Am Trying to Be Marvelous: Poetics of Body Positivity” Seminar with Emilia Phillips and a Reading by Emilia Phillips and Angela Pilson, hosted by the Poetry Society of South Carolina, Charleston Library Society, 164 King Street, Charleston, SC. Wednesday, March 7–Saturday, March 10, 2018: Associated Writers & Writing Programs (AWP) Conference, Tampa, FL. TBD: The Art of Unlearning in the Creative Writing Workshop (Amina Gautier, Emilia Phillips, Patrick Bizzaro, Hadara Bar-Nadav, Christopher Salerno). Teachers of Creative Writing discuss impeding tendencies students often transfer into the workshop from their courses in Literature and Composition (as well as their own commonly held misperceptions). The panel will explore ways of facilitating a modern workshop classroom by helping students unlearn certain presuppositions about the processes of reading, writing, and evaluating in a workshop setting while also building the skill set important for writers operating in this unique environment. Monday, March 12–April 6, 2018: The Upside-Down: Contemporary Pastorals and Necropastorals, a generative online poetry workshop through 24PearlStreet from the Fine Arts Works Center of Provincetown. Sunday, April 8, 2018: Dead Rabbits Reading Series, New York, NY. Monday, April 9, 2018: A Poetic Study of Erasure, Compression, & White Space with Emilia Phillips, Metropolitan New York Library Council, 599 11th Ave, New York, NY. Saturday, April 21, 2018: North Carolina Writers’ Network Spring Conference, University of North Carolina at Greensboro, Greensboro, NC. Thursday, March 22, 2018: A Reading by Emilia Phillips, MFA in Writing Program, University of North Carolina at Greensboro, Greensboro, NC. Thursday, March 29, 2018: A Reading by Emilia Phillips, MFA in Writing Program, University of New Hampshire, Durham, NH. Monday, April 9–Friday, May 4, 2018: Call (Out): Imitation, Invective, and Conversation, a generative online poetry workshop through 24PearlStreet from the Fine Arts Works Center of Provincetown. Saturday, April 14, 2018: This Darksome Burn: Experiential Poetic Sound with Emilia Phillips, a master class and reading, Flat Iron Writers’ Room, Asheville, NC. Thursday, November 30, 2017: A Reading by Natalie Shapero with Emilia Phillips, MFA in Writing Program, University of North Carolina at Greensboro, Scuppernong Books, Greensboro, NC. Saturday, November 18, 2017, 7 PM: House Party Reading: Emilia Phillips, Joy Priest, and Thomas Mira y Lopez, 2313 Woodbury Dr, Hillsborough, NC. Monday, October 9–Saturday, October 14, 2017: Residency and Reading at Appomattox Regional Governor’s School, Pertersburg, VA.
Sunday, June 25–Saturday, July 1, 2017: Faculty, Camp ArtWorks at Elizabethtown College, Elizabethtown, PA.
Saturday, May 26–Sunday, May 27, 2017: This Last, Selfish Stitch: On Empathy, Appropriation, and Writing Poems About the Body, SAFTA Poetry Retreat, Sundress Academy for the Arts, Knoxville, TN. Saturday, April 8, 2017: Westchester Poetry Festival with Mark Doty, Joshua Bennett, Tim McGillicuddy, Kamilah Aisha Moon, Emilia Phillips, Max Ritvo (read by Ariella Ritvo-Slifka) and Terese Svoboda, Estherwood Mansion, The Masters School, 49 Clinton Ave., Dobbs Ferry, NY. Thursday, March 30, 2017: Visiting Writer Series at Warren County Community College: Emilia Phillips, Washington, NJ. Wednesday, March 29, 2017: Faculty Conversation: Academic Freedom with Terri Klemm, Roger Anderson, and Emilia Phillips, President’s Circle Room, Lackland Center, Centenary University, Hackettstown, NJ. Thursday, March 23, 4:00—5:30 PM: Poetry: Finding Our Space with Temple Cone (Guzzle), Emilia Phillips (Groundspeed), and Ravi Shankar (What Else Could it Be: Ekphrastics and Collaborations), Virginia Festival of the Book, New Dominion Bookshop, 404 E. Main St., Charlottesville, VA.
Wednesday, March 15, 2017: Poetry Workshop Leader, Teen Arts Program, Warren County Cultural & Heritage Commission, Warren County, NJ. Location, time, and details TBD. How do we make our poems “flow”? How many word fireworks can we set off in a single line of poetry? In this workshop, we will explore the sounds and rhythms of free-verse poetry by listening to poems, trying out new techniques, and writing our own new poems. Ever heard the phrase, “The medium is the message”? In this poetry workshop, we’ll try our hand at writing poems using different mediums-posterboard, postcards, typewriters, and on our toes-to see if we can appeal to different parts of our brains and become more creative. Thursday, March 9, 2017: Judge, New Jersey State Finals of Poetry Out Loud, Mayo Concert Hall, The College of New Jersey, Ewing, NJ. Wednesday, March 1, 2017, 12:30 PM: Visit to Bards & Scribes Creative Writing Club, Bergen Community College, Paramus, NJ. Thursday, February 9, 7:00–9:00 PM: An Offsite Reading Sponsored by Forklift, Ohio, H_NGM_N, Slope Editions, Big Bell, and Poetry City, USA, Dew Drop Inn, 2801 8th Street NE, Washington, D.C. 20017. Friday, February 10, 3:00–4:15 PM: Bull City Press 10th Anniversary Reading: Anders Carlson-Wee, Tiana Clark, Emilia Phillips, and moderator Ross White. Room 203AB, Washington Convention Center, Level Two. Saturday, February 11, 11:00 AM–12:00 PM: Book Signing, University of Akron Press, AWP Bookfair, Table 620-T.
Saturday, February 11, 2:00–3:00 PM: Chapbook Signing, Bull City Press, AWP Bookfair, Table 672. 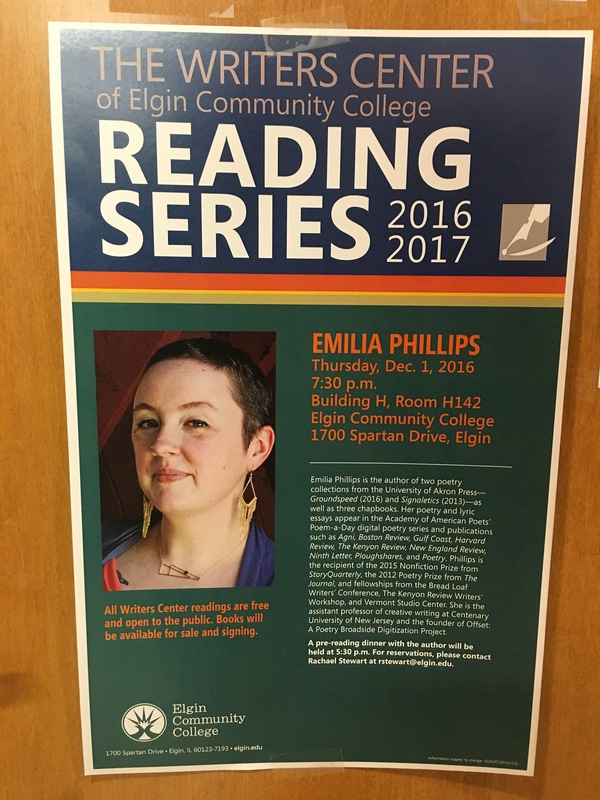 Friday, January 20, 2017, 6:00 PM: A Reading by Emilia Phillips at Kent Place Coffeehouse, Kent Place School, Summitt, NJ. Wednesday, November 16, 2016, 7:00 PM: “It’s Alive: Why Poetry Still Matters in the 21st Century,” Rutherford Hall Lecture Series, 1686 County Road 517, Allamuchy, NJ. Monday, November 7, 2016, 5:00 PM: Lightning Talk: “Offset: On Digitizing Letterpress Poetry Broadsides for Digital Spaces, DLF Forum 2016, Milwaukee, WI. Through its online gallery of contemporary poetry broadsides, Offset: A Broadside Digitization Project investigates the relationship between the poetic page and digital spaces, considering poetry’s viability across publishing platforms and its legacy through digitization. Project founder Emilia Phillips will present a narrative of the project and its supportive research. Wednesday, November 2, 2016, 7:00 PM: The Williams Poetry Readings: Emilia Phillips, Williams Center for the Arts, 1 Williams Plaza, Rutherford, NJ. Tuesday, November 1, 2016, 10–10:30 AM: Inside Centenary, WRNJ Radio. Friday, October 28, 2016, 10 AM: A Reading and Q&A by Apryl Lee and Emilia Phillips at Montclair State University, Montclair, NJ. Saturday, October 8, 2016, 12:45 pm PDT: Off the Richter Scale’s Anon Was a Female Poet: A Reading by Teow Lim Goh, Emilia Phillips, Margaret Ross, Solmaz Sharif, and Tess Taylor, Litquake, Mechanics’ Institute Library & Chess Room, 57 Post St, San Francisco, CA. The event is free. To RSVP to the event, visit the event page on Facebook. Saturday, September 24, 2016: “Walk the Line: The Tension Between Line and Syntax,” a poetry workshop by Emilia Phillips, The Hudson Valley Writers’ Center, 300 Riverside Drive, Sleepy Hollow, NY. Tuesday, September 20, 2016, 10–11 AM: Inside Centenary, WRNJ Radio. Sunday, July 31, 2016: A Reading by Jenny Johnson, Rachel Mennies, Emilia Phillips, and Lauren Russell, East End Book Exchange, 4754 Liberty Avenue, Pittsburgh, PA. Facebook event page. Tuesday, June 28, 2016, 4:30 PM: Rose O’Neill Literary House Summer Poetry Salon Reading: Emilia Phillips and Lesley Wheeler, Rose O’Neill Literary House at Washington College, Chestertown, MD. Wednesday, June 22 and Thursday, June 23, 2016: Visiting Faculty at Drew University Low-Residency MFA in Poetry Program, 36 Madison Avenue, Madison, NJ. Wednesday, June 22, 7:00 PM: Faculty Reading: Aracelis Girmay and Emilia Phillips, Founders Room. Readings are free and open to the public. RSVP available at the link. Thursday, June 23, 2:00–3:00 PM: Lecture: “it will not / be the I: Thirteen Vivisections into Writing About the Body and the Corporeality of the Lyric” by Emilia Phillips, Arts 106. Thursday, June 16, 2016, 7:00 PM: A Reading by Hossannah Asuncion, Aracelis Girmay, Emilia Phillips, and R.A. Villanueva, Berl’s Brooklyn Poetry Shop, 141 Front Street in D.U.M.B.O, Brooklyn, NY. Sunday, May 15, 2016: Women Reading Women Series with Cecelia Llompart and Emilia Phillips, The Hudson Valley Writers’ Center, 300 Riverside Drive, Sleepy Hollow, NY. Friday, May 13, 2016, 7:45 PM: Station Note Reading Series: Duncan Campbell and Emilia Phillips, 3S Artspace, 319 Vaughan St., Portsmouth, NH. RSVP with the Facebook event page. Tuesday, May 3, 2016, 6:30 PM: Poetry Reading & Talk, Hackettstown Public Library, 110 Church Street, Hackettstown, NJ. Monsters of Poetry Reading Series presents Erika Meitner, Emily Wilson, Mark Levine, Josh Bell, and Emilia Phillips. Saturday, April 23rd. Doors = 7:30pm, Poems = 8pm. A 3 dollar donation to the cause gets you a ticket for our literary raffle, giving away signed copies of books and other lovely literary merchandise. The Word Works, in collaboration with Friendship Heights Village, will feature readings by the poets Emilia Phillips and Elisavietta Ritchie. Café Muse opens at 7 pm with refreshments and classical guitar by Michael Davis; readings begin at 7:30.Friendship Heights Village Center is a 7 minute walk from Friendship Heights Western Avenue Redline subway stop. All Café Muse programs are free to the public and handicap accessible. Come out and hear some good poetry, and read some of your own! We work with the Chicago Feminist Writers & Artists to support the safety of our space. The Dollhouse is a level two space where oppressive behavior is not welcome. We define oppressive behavior as that which antagonizes people that are in a lesser position of power, whether it be violence predicated upon gender, sexual orientation, race, physical ability, class, social status, or other characteristics. If someone has vocalized that you have caused harm to them you will be preemptively asked not to attend by the organizers of the event, or asked to leave at the space. Thursday, March 31, 1:30–2:45 PM. R212. Women Who Edit: Literary Journals. (Mary Flinn, Lindsay Garbutt, Sumita Chakraborty, Corinne Manning, Emily Nemens) With a focus on the particular challenges to and accomplishments by women literary magazine editors, the panelists discuss their roles as editors-in-chief, founders, and genre editors at their respective magazines. Additionally, they consider the idea that gender parity in editorial positions promotes parity among contributors, and explore potential opportunities to cultivate a new generation of women editors through mentorship and example. *Note: I am the organizer for this panel; as such, I will not be speaking on the panel. Thursday, March 31, 6:30 PM, Offsite Reading: Bull City Press, Four Way Books, and Persea Books, Little Easy, 216 W. 5th Street, Los Angeles, CA. Friday, April 1, 1:00–2:00 PM, A Book Signing for Groundspeed, Bookfair Table #313. Friday, April 1, 7:00–9:00 PM, Offsite Reading: University of Akron Press, Cleveland State University Press, and Rescue Press, Seahorse Studios/Handbag Factory, 1334 S. Grand Avenue, Los Angeles, CA. Saturday, April 2, 12:00 PM–1:00 PM, Writer to Writer Bookfair Ambassador, AWP Booth. S209. Remembering Claudia Emerson. (Emilia Phillips, Jill McCorkle, Kathleen Graber) Claudia Emerson’s death in late 2014 grieved her friends and her readers. This event features panelists remembering her spirit and her work and inviting audience members to participate by also reading her poems so that her single voice resonates through a chorus of witnesses. The panelists focus on her posthumous books, The Opposite House and The Impossible Bottle. For additional information about the conference, visit the AWP Conference website. Saturday, March 26, 7:00 PM: A Reading by Katelyn Kiley and Emilia Phillips, Chop Suey Books, 2913 West Cary Street, Richmond, VA.
Wednesday, March 16, 6:00–8:00 PM: A Book Release Party for Groundspeed and A Reading by Emilia Phillips, Assistant Professor of Creative Writing, Taylor Memorial Library, Centenary College, Hackettstown, NJ.